UPDATE: THE GANG OF HARLEYS WAS AMAZING! A parade of Harley Quinn cosplayers crossed the stage at the DC Booth today, and it was awesome. From "Animated Series Harley," to "Bombshell Harley," to "Harley the Riveter" to "Daddy's Little Monster Harley," they all got a chance to have Amanda Conner and Jimmy Palmiotti check out their cosplay. Check out their group shot!! Who would you have voted to be the Crown Princess of Crime?? Check out our gallery, above, follow @DCCOMICS on Twitter and Instagram to see more images, and stay tuned for an upcoming episode of DC All Access to see video coverage! 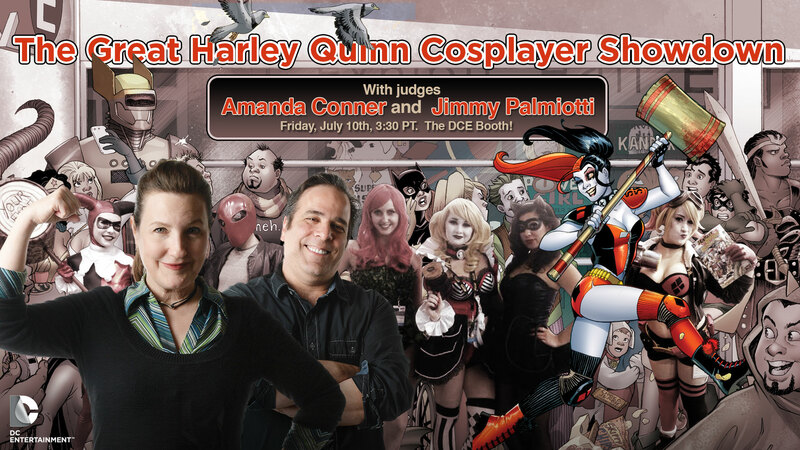 Join the Harley Quinn creative team of Amanda Conner and Jimmy Palmiotti for the first-ever Great Harley Quinn Cosplayer Showdown at Comic-Con International: San Diego 2015! Show up at the DC Entertainment booth (#1915) in your best Harley Quinn costume for your shot at being judged the Crown Princess of Crime*. Do you consider yourself a “Brassy Lassie?” Have you ever been accused of being “insubordinate?” Are you looking to take a bite out of crime and be part of something bigger than yourself? If you’ve answered “yes” to all these questions, you might be a good fit for Harley Quinn’s new offbeat start-up business: The Gang of Harleys. A working knowledge of weapons is a plus. There is just too much crime and too little time. Harley needs help! Bring your execution, enthusiasm, and attitude, and spread the word! Join the Gang of Harleys! *Click here for the Great Harley Quinn Showdown Promotion Official Rules!